Consumers in today's fragmented media landscape have so many ways to discover content across many devices and platforms. 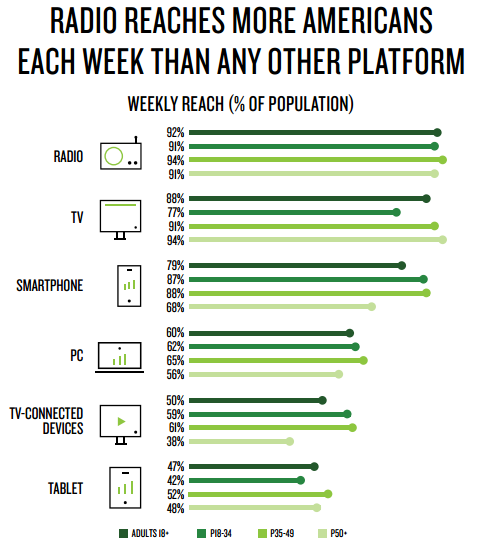 However, according to Nielsen's Audio Today Report, radio continues to reach more Americans each week than any other platform. With the advance of technology, it becomes easier to listen to more radio with each passing month. According to the firm's latest MediaTech Trender, nearly a quarter of U.S. households (24%) own a smart speaker as of Q2 of this year. In the new Audio Today report, Nielsen focused on network radio and the roster of curated content that reaches large numbers of radio listeners all across America. 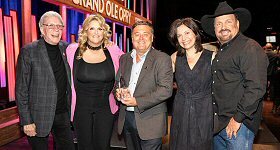 Powered by dozens of networks and syndicators which supply programming to thousands of stations, Nielsen says network radio has something for everyone. The data backs this up, as 94% of all radio listeners nationwide tune to a network affiliated station every week. Network programming and services are radio's national currency, with a large and diverse catalog of syndicated audio content which includes everything from 24-hour music channels to sports talk and political analysis, as well as some of the biggest personalities in radio. 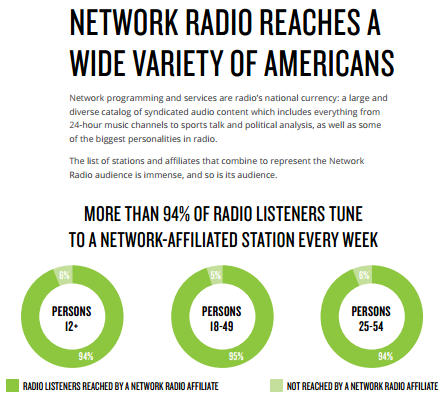 Because the majority of radio listeners are also reached by network affiliates, the network audience closely mirrors the total radio audience with 95% of radio listeners, 18-49, tuning to a network-affiliated station each week.